The aftermath of a fire that destroyed several boats Sunday at South Benson Marina. 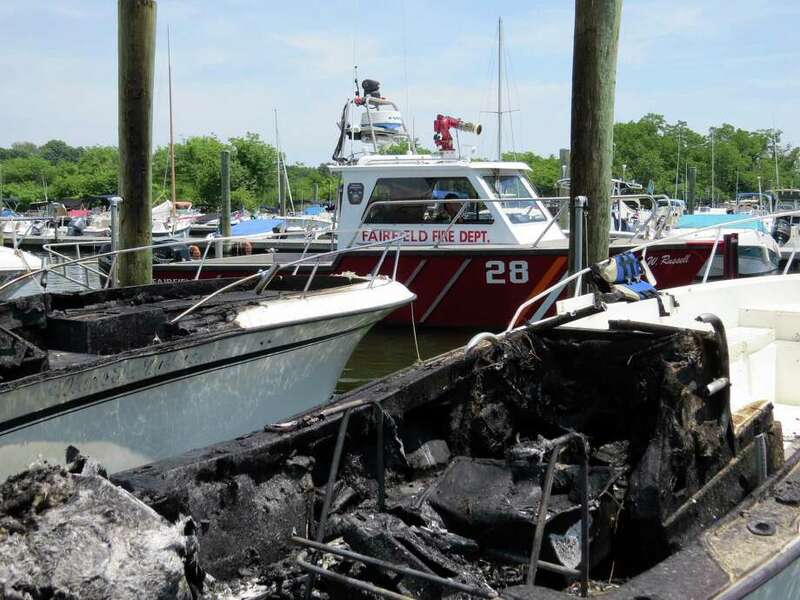 Two boats were destroyed and several others damaged Sunday afternoon when fire erupted at South Benson Marina, briefly stranding people on a dock as flames blocked their path back to shore. No one was seriously injured in the fire reported about 12:30 p.m. Sunday, according to the fire reports, but in addition to the two power boats completely destroyed by fire, two other vessels suffered moderate to severe damage while two others had minor damage. The two most seriously burned boats suffered damage estimated at more than $40,000, according to initial estimates by the Fire Marshal's office. Heavy smoke and fire were wafting over the marina when the first firefighters arrived on scene, followed quickly by additional fire units and police personnel, as well as mutual-aid from Bridgeport. Several people were trapped at the end of the marina's G dock, their route to safety blocked by flames consuming the boats. Another man working on his boat jumped into the water to avoid the advancing fire, according to the report. While fire and police boats helped remove people stranded on G dock, a civilian helped emergency personnel rescue the man who jumped into the marina waters. The man later refused medical treatment, saying he had only minor cuts, firefighters said. Meanwhile other fire crews limited the spread of flames from the heavily involved boats, and cooled off nearby vessels to prevent additional damage. Crews also controlled fuel discharged by the damaged boats to ensure it did not feed the fire and ignite a broader conflagration. The Fire Marshal indicated the fire apparently was triggered in one of the boats when an electrical spark ignited accumulated gasoline vapors as a boater plugged in an extension cord. The damaged boats were later removed from the marina to prevent additional environmental damage from fire debris and fuel leakage. "While the damage to the boats was significant, we were extremely lucky that no one was seriously injured and the marina was able to resume 95 percent of its normal operations within two hours of this fire," Assistant Fire Chief Scott Bisson said in a statement issued after the fire. "Additionally, this fire showed the results of years of practical training and equipment acquisitions through homeland security grants where all agencies work together as a unified team protecting the coastal waters of Fairfield County."